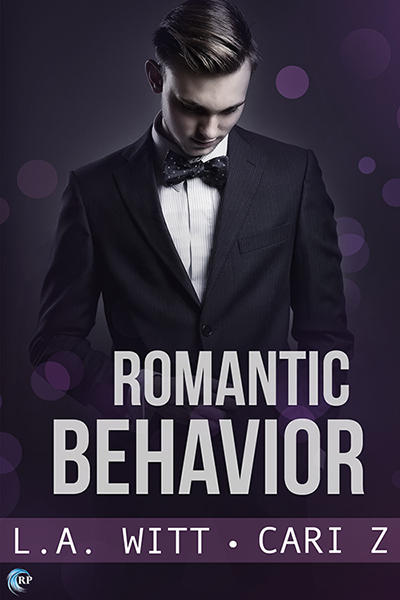 Romantic Behavior (Bad Behavior book 4) by Cari Z and LA Witt virtual tour | Spotlight, Excerpt & #giveaway @RiptideBooks @GallagherWitt). They're going to make it to the altar, even if it kills them. Andreas was acting . . . strange. Not “I’m meeting with a drug lord behind your back” strange, or “My kids don’t know about us but I’m going to invite them all to dinner and the hell with it” strange, thank God. We were past those points in our relationship. All of the big surprises were out of the way: everybody knew about us, nobody cared, our families were happy, and neither of us were involved in anything shady for the greater good. At least, I was pretty sure we weren’t. I wasn’t, but then I wasn’t the one on edge. You wouldn’t think it had been less than two weeks since we’d come back to the precinct after the best vacation of my life. Three weeks of sunshine, sand, clear blue water, and tropical drinks with paper umbrellas that I’d saved to give to Emily, Andreas’s youngest. It had been a nice trip—a necessary trip, as far as I was concerned, the first real break we’d gotten from the job while neither of us was recovering from an injury. My stab wound was nothing but a scar now, and Andreas’s ankle was strong enough that he’d supported my weight and his for long enough to— Well, it was fine, is the point. Pretty much recovered. Andreas scratched a fingernail across the pocket of his jeans, the fabric stuttering under the force of his hand. He’d been worrying that seam for the past half hour. “You’re going to wear a hole in that if you don’t let up,” I said for the second time that afternoon. “What?” He glanced at his hand. “Oh.” He took his hand away, only for his fingers to end up tapping the top of the desk a minute later. “Because you’re acting like Erin when she’s had nothing but Coke to drink for an entire shift.” Erin was Andreas’s oldest daughter, and she worked here in the precinct as an admin for the Internal Affairs office. She was nice enough that people got along with her despite that, though. Andreas shook his head. “I’m fine.” His phone buzzed, and he picked it up and grimaced at the number. “I’ve got to take this. I’ll be right back.” He left without another word, and I watched him go, then sidled over to Paula’s desk on the other side of the bull pen. “What’s wrong with who?” Paula squinted at her computer screen and tapped the backspace key. She was as bad as Andreas when it came to wearing her reading glasses at work. “What’s wrong with Andreas?” Paula Morris was probably Andreas’s closest friend, and the hardest worker in the entire precinct. She’d helped us close some very big cases over the past year, and if anyone knew what was going on with him, it was her. “He’s acting cagey, and he hasn’t met my eyes all day. I don’t think he’s going to tell me anything right now.” And it hit me, just then, how bothered I was by that. I thought we were past the big denials, the keeping-things-to-yourself phase that had sucked so bad. Paula was right. I was his boyfriend. I should know what was going on. That I didn’t was disturbing. “Be a man!” she shouted at my back as I returned to my desk. “Sure.” We hadn’t been out to dinner since we’d gotten back from vacation. “That sounds great. You want to invite any of the kids?” Erin had a date with her boyfriend, I was pretty sure, and we didn’t have Emily this weekend, but Lisa, Andreas’s ex, was always willing to share time. Head over to Riptide Publishing to read this excerpt in it's entirety. You can also learn more about the Authors and the series on the Bad Behavior series page. Riptide giveaway... To celebrate the release of Romantic Behavior, one lucky winner will receive a $10 Riptide credit and their choice in an ebook from each of Cari and L.A.’s backlist! Leave a comment with your contact info to enter the contest. Entries close at midnight, Eastern time, on January 20, 2018. Contest is NOT restricted to U.S. entries. Thanks for following the tour, and don’t forget to leave your contact info! I'm looking forward to reading this series! I haven't read all the books in the series but it is pretty good. The characters in this series were vivid ones, and the pace was snappy. There was more violence in the books than my usual reading material, but I like fluff. :) Some of L.A.'s books are low angst, but she and Cari Z. put the protagonist through a lot in this series.